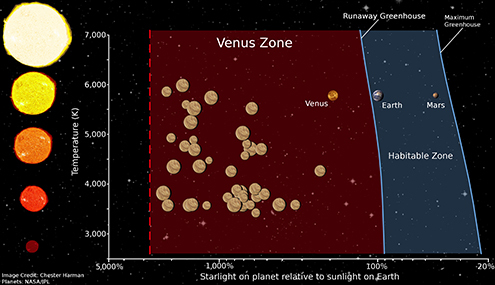 SAN FRANCISCO, Sept. 10, 2014 -- San Francisco State University astronomer Stephen Kane and a team of researchers presented today the definition of a "Venus Zone," the area around a star in which a planet is likely to exhibit the unlivable conditions found on the planet Venus. The research will help astronomers determine which planets discovered with NASA's Kepler telescope -- which has a primary mission of finding habitable planets similar to Earth -- are actually more analogous to Earth's similarly-sized sister planet. Knowing how common Venus-like planets are elsewhere will also help astronomers understand why Earth's atmosphere evolved in ways vastly different from its neighbor. 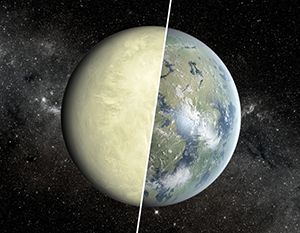 "We believe the Earth and Venus had similar starts in terms of their atmospheric evolution," said Kane, an assistant professor of physics and astronomy at SF State and lead author of the study published online today. "Something changed at one point, and the obvious difference between the two is proximity to the Sun." The Kepler telescope is used to find planets outside our solar system, called exoplanets, located within or near the habitable zone in which a planet can hold liquid water on its surface. Earlier this year, Kane was part of an international team of researchers that discovered one such planet orbiting the dwarf star Kepler-186. The main way this search is conducted, however, is by looking for exoplanets that are roughly the same size as Earth. That, according to Kane, poses a problem because our own solar system contains two planets of the same size -- Earth and Venus -- that have vastly different atmospheric and surface conditions. "The Earth is Dr. Jekyll and Venus is Mr. Hyde, and you can't distinguish between the two based only on size," said Kane, who runs a website tracking known exoplanets. "So the question then is how do you define those differences, and how many 'Venuses' is Kepler actually finding?" To watch a video of Kane discussing his latest research, visit http://youtu.be/uiE5tjm65mY. Kane and his fellow researchers at Penn State University and the NASA Goddard Space Flight Center in Maryland used "solar flux" -- or the amount of a star's energy that a planet receives -- to define the inner and outer edges of the Venus Zone. The point at which a planet's atmosphere would experience runaway greenhouse-gas effects like those seen on Venus -- a point located just inside Earth's orbit in our solar system -- forms the outer boundary. The point at which the planet's atmosphere would be completely eroded away by the stellar energy marks the inner boundary. If Kepler astronomers discover a planet that is similar in size to Earth but located within the solar-flux range that makes up the Venus Zone, that could be a clue the planet is more like Venus than Earth, and therefore is uninhabitable. Future space-based telescopes will allow researchers to begin receiving data on these exoplanets' atmospheres, helping them confirm whether they are "Venuses" or "Earths." "If we find all of these planets in the Venus Zone have a runaway greenhouse-gas effect, then we know that the distance a planet is from its star is a major determining factor," Kane added. "That's helpful to understanding the history between Venus and Earth." Future research will look at whether the amount of carbon in a planet's atmosphere impacts the boundaries of the Venus Zone, for example by pushing the outer boundary farther away from the star for planets with greater concentrations of carbon. "This is ultimately about putting our solar system in context," according to Kane. "We want to know if various aspects of our solar system are rare or common." "On the frequency of potential Venus analogs from Kepler data" by Stephen R. Kane, Ravi Kumar Kopparapu and Shawn D. Domagal-Goldman was published online Sept. 10 in arXiv and is available online at http://arxiv.org/abs/1409.2886. It has been accepted for publication in an upcoming issue of the Astrophysical Journal Letters. SF State is the only master's-level public university serving the counties of San Francisco, San Mateo and Marin. The University enrolls nearly 30,000 students each year and offers nationally acclaimed programs in a range of fields -- from creative writing, cinema, biology and history to broadcast and electronic communication arts, theatre arts and ethnic studies. 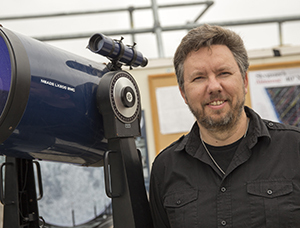 SF State faculty and students were pioneers in the discovery of planets outside of the solar system known as exoplanets, and since 1995, SF State faculty have discovered more than 500 such planets. The University’s more than 228,000 graduates have contributed to the economic, cultural and civic fabric of San Francisco and beyond.